The three basic techniques for cooking rice with hot liquid are boiling, absorption, and steaming, which are perhaps the most popular methods for cooking all whole grains. Often a combination of these methods is used to cook rice depending on the type of rice, the particular recipe, or the desired effect. Some types of rice benefit from soaking before they are cooked because cooking with hot liquid alone may not produce the optimum results. Boiling is one of the easiest methods for cooking rice. The grain is cooked uncovered in a large quantity of water. The rice and water are then dumped into a colander and drained for several minutes to remove the excess moisture. This method is often the best when there is some doubt as to the correct quantity of water that can be absorbed by the rice. 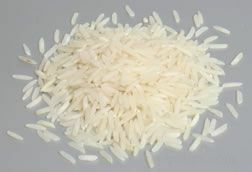 Cooking rice with the absorption method is, perhaps, the method that most people are accustomed to when cooking rice, but it is often the most difficult. This technique requires that the rice be cooked in a specific quantity of liquid, which can be readily absorbed by the rice. The absorption method may require some trial and error, but it is most often successful when slight adjustments are made to recipes based on variables that may affect the success of the absorption cooking method, such as the accuracy of the heat source, the altitude, and age and quality of the rice. Steaming is the third method for cooking rice and although it is the most time consuming, it produces beautifully cooked rice. The rice slowly absorbs moisture and cooks very evenly. The technique used for cooking rice has much to do with the starch content of the rice and the variety of rice, as well as cultural preferences. Short-grain, medium-grain, and long-grain varieties often have different uses and are cooked using different methods. Short-grain rice is very starchy, and the grains have a tendency to stick together. When it is to be used simply as a side dish, it is usually steamed, which helps prevent the grains from becoming too sticky. If it is to be used for sushi or for recipes where rice is molded into shapes, then it should be boiled, which encourages the grains to stick together. 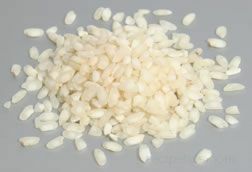 Some types of short-grain rice, such as Italian varieties, are cooked with the absorption method and are constantly stirred. The stirring releases the starch in the rice, which acts as a thickener and results in a very creamy consistency in a number of dishes, such as risotto. Medium-grain rice is less sticky when boiled or steamed, but it tends to clump together after it has cooled. It holds plenty of moisture when it is cooked and remains a bit firmer than short-grain rice. Spanish paella recipes are popular dishes that use medium-grain rice varieties, such as Valencia, resulting in grains that are slightly sticky when cooked, yet separate fairly easily. Long-grain rice is fluffy, dry, and does not stick together, so it can be cooked using any of the three hot liquid cooking methods: boiling, absorption, and steaming. 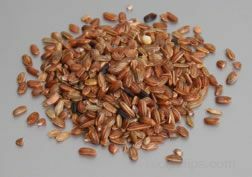 It is used in pilafs, salads, and a variety of cooked dishes, such as stuffing, meats, soups, and casseroles. Long-grain rice is the most common type cultivated and used in the United States.